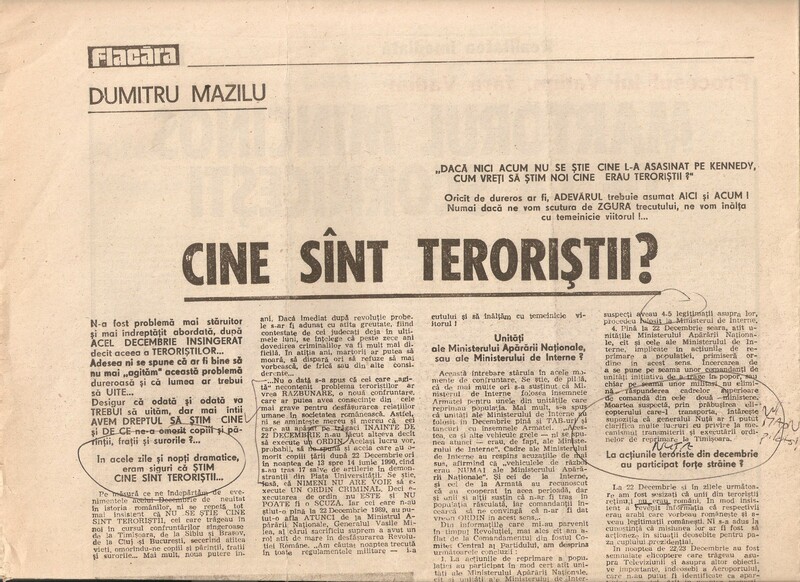 I discussed Dumitru Mazilu’s 1991 description of the guerrilla warfare tactics used in Romania beginning from the evening of 22 December 1989 and who they concluded was responsible for the guerilla attacks in pp. 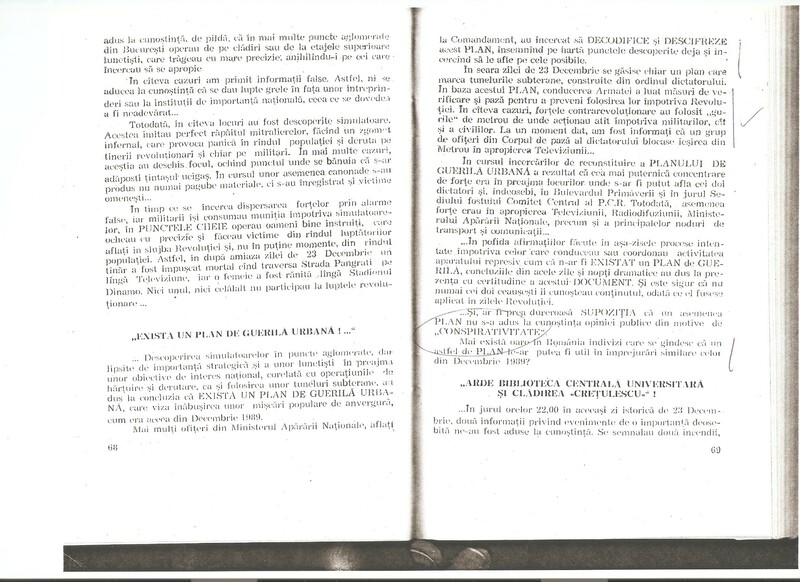 317-318 of my Ph.D. Dissertation at at Indiana University: Richard Andrew Hall, Rewriting the Revolution: Authoritarian Regime-State Relations and the Triumph of Securitate Revisionism in Post-Ceausescu Romania (defended 16 December 1996). 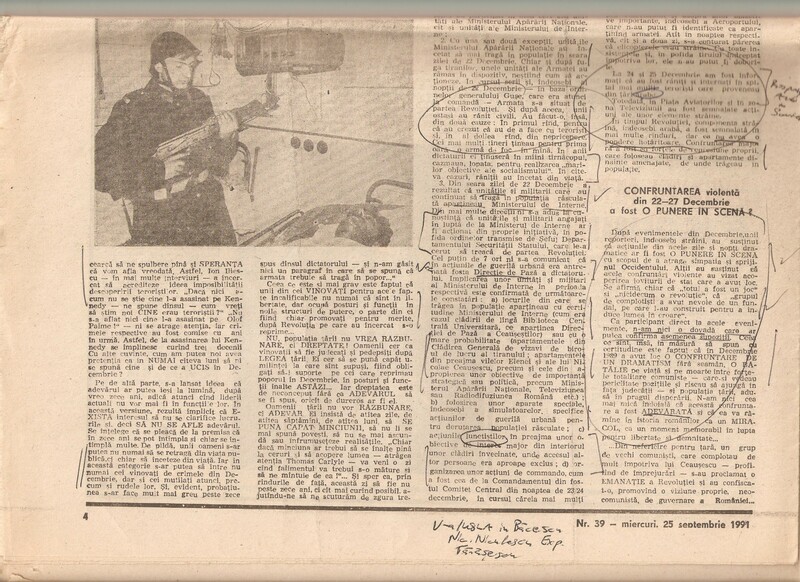 Mazilu’s characterization of what transpired in December 1989 as having been “guerilla warfare” is in line with many of the reports in the field in December 1989, as the following excerpts suggest. Assisting the hit-and-run tactics of the Securitate forces since Friday has been a vast system of secret tunnels and at least 48 intelligence safe houses built in Bucharest, some of which were uncovered today, according to the Bucharest radio. In some of the tunnels are bunkers containing supplies of food and ammunition. Friday night’s jubilation in Bucharest at Ceausescu’s ouster gave way Saturday morning to confusion and fear as pro-Ceausescu forces continued to wage guerrilla warfare in the city streets with a seemingly limitless supply of weapons and ammunition. VIENNA, AUSTRIA VIENNA, Austria (AP) _ Romanian revolutionary soldiers found a vast labyrinth of safe houses and tunnels used by police forces loyal to Nicolae Ceausescu, some with secret entries in cemetery burial vaults and subway systems. Army officers speaking on Bucharest radio Sunday said the sprawling maze of tunnels criss-cross the city and link two airports, Communist Party headquarters and Ceausescu’s palace in downtown Bucharest. Army units siding with pro-reform protesters have been battling Ceausescu’s secret police for control of the country. The highly trained and heavily armed security forces have been making hit-and-run guerrilla attacks, mostly at night. The radio report went into stunning detail about the hundreds of safe houses and miles upon miles of underground tunnels stuffed with weapons. The reported execution came as the army announced plans for a “final offensive” against the pro-Ceausescu security forces who have carried on guerrilla warfare throughout the capital and cities elsewhere in the country since the dictator’s downfall.